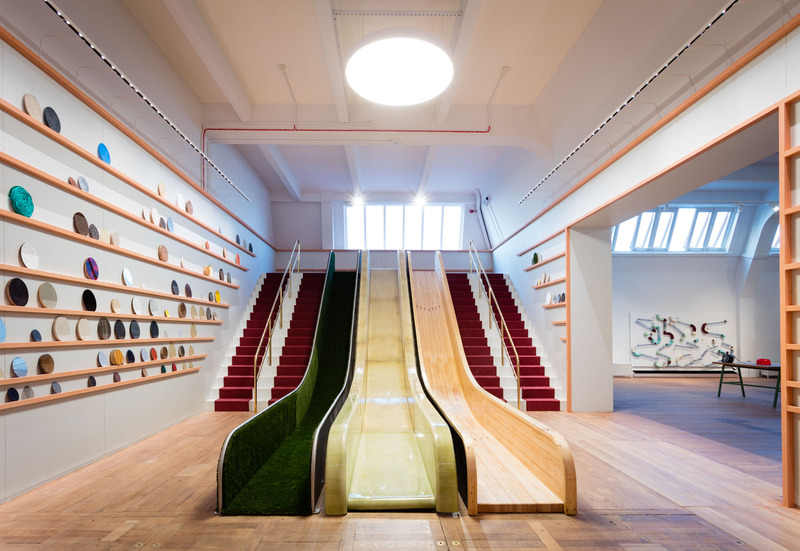 When the new Design Museum in Kensington Gardens, London opened to the public on the November 24th, many aesthetically astute Brits flocked to the new "palace of culture." 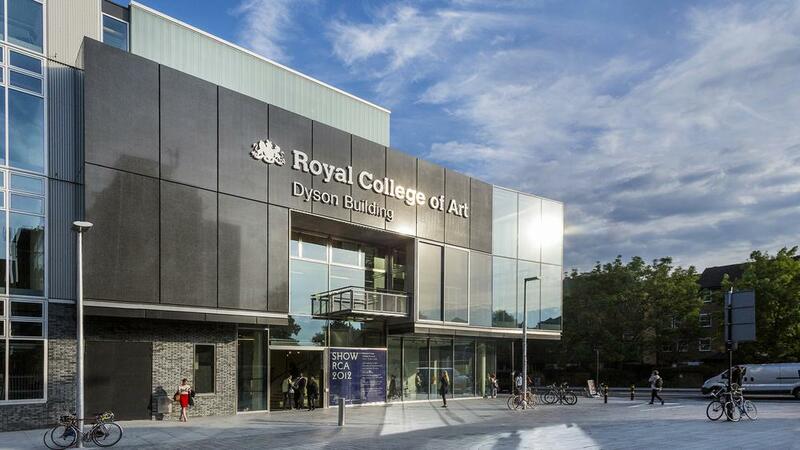 There they found the post-war (landmarked) relic, originally designed for the Commonwealth Institute by Robert Matthew Johnson-Marshall & Partners and opened by Queen Elizabeth II in 1962, reincarnated and open once again. However, despite director of the museum Deyan Sudjic recruiting the likes of John Pawson and OMA for the renovation, the reaction to the $104 million museum has been mixed. The exhibitions inside, though, have enjoyed a much warmer reception. The inaugural exhibit, Fear And Love: Reactions to a Complex World features exhibition design by Sam Jacob Studio and eleven diverse installations from the likes of Andrés Jaque, Neri Oxman, and OMA/AMO. The London-based designer has employed a 623-foot-long pleated felt curtain that articulates the installation spaces and acts as a fluid circulatory device as it meanders through the rectangular exhibition area. With breaks interspersed throughout the curtain trail, views across and into each of the installations are created, opening up what would be tight corners to form a coherent space. While this material carries warmth with it on its journey through Fear And Love, the use of gray translucent PVC bares the opposite (and perhaps even hints at love in another sense). Working with graphic designers OK-RM, signage within Fear And Love displays information on a series of freestanding, bent steel frames of which have been given a protective, passivated finish, giving a modern and iridescent look. 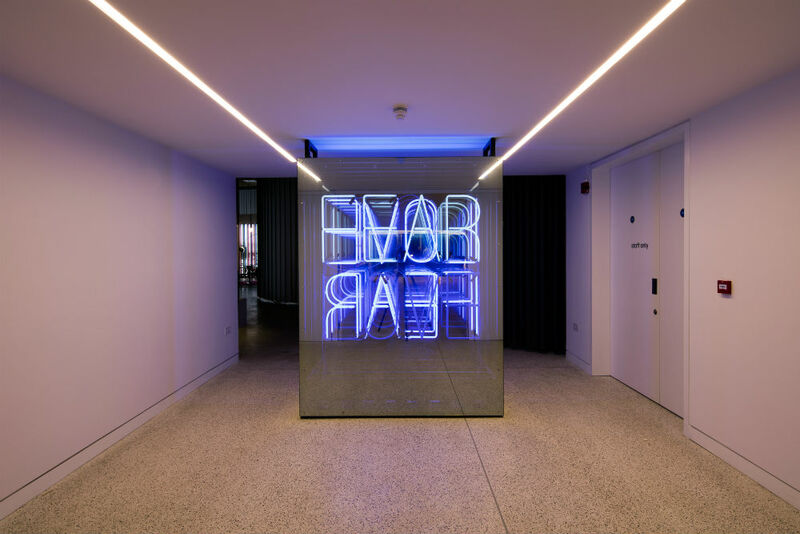 This aesthetic is furthered through a neon two-way mirror totem that displays the words "FEAR" and "LOVE" to those passing by the exhibition inside the museum. 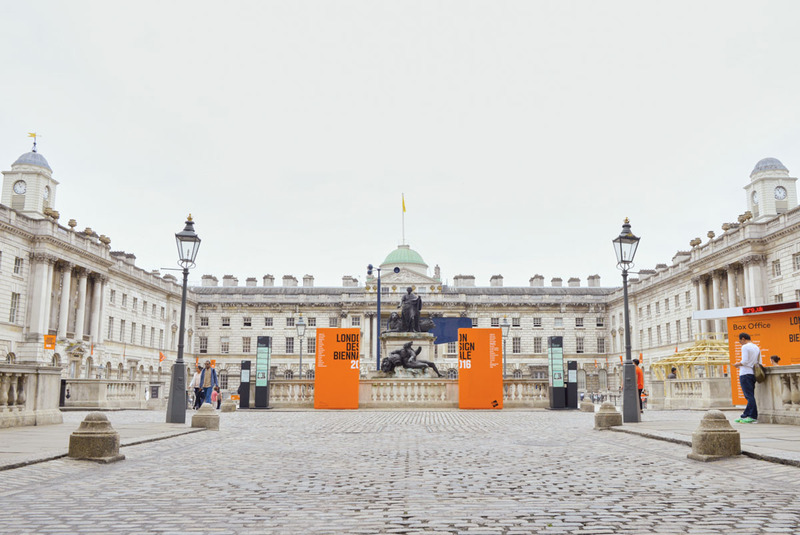 Meanwhile, Chloë Leen, who spearheaded the project for Sam Jacob Studio commented: “It has been a great privilege to work with 11 designers at the forefront of shaping contemporary practice. Our design creates a unifying experience, choreographing these varied complex ideas and installations, while the spaces and moods of the exhibition design give each a distinct quality. This duality was at the heart of the de-sign challenge that the museum’s curatorial position presented.” Fear and Love runs through April 23, 2017. British artist Alex Hartley reflects on the power of nature in his latest work, A Gentle Collapsing II, as part of his After You Left exhibition at Victoria Miro in London. 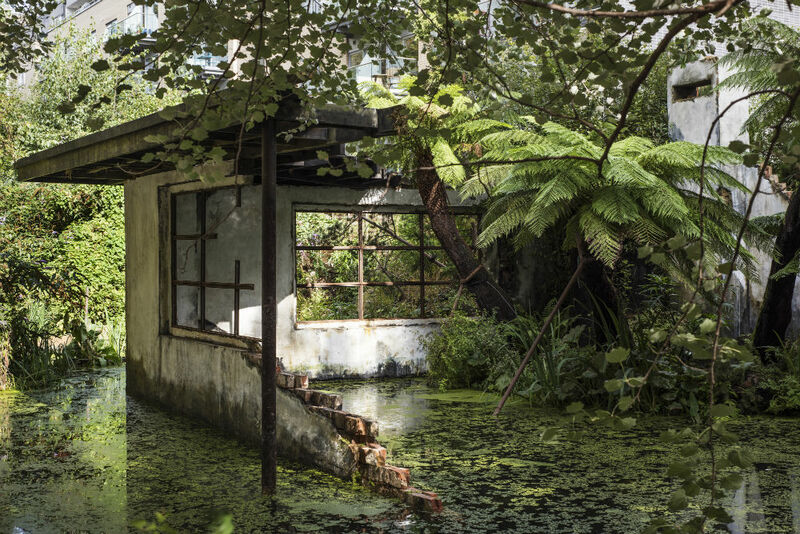 The work—set in the gallery's garden—features an abandoned modernist dwelling that has been engulfed by a jungle landscape, provoking thoughts on decay, the built environment, and nature itself. The aesthetically appealing juxtaposition of wild and the artificial goes hand-in-hand with Hartley's take on modernism: The International Style house embodies the architectural movement's ideals of form and structural purity, but all sense of order has been lost. The forest is the victor. With A Gentle Collapsing II, Hartley references Plato's notion of artifacts being in a "state of becoming." 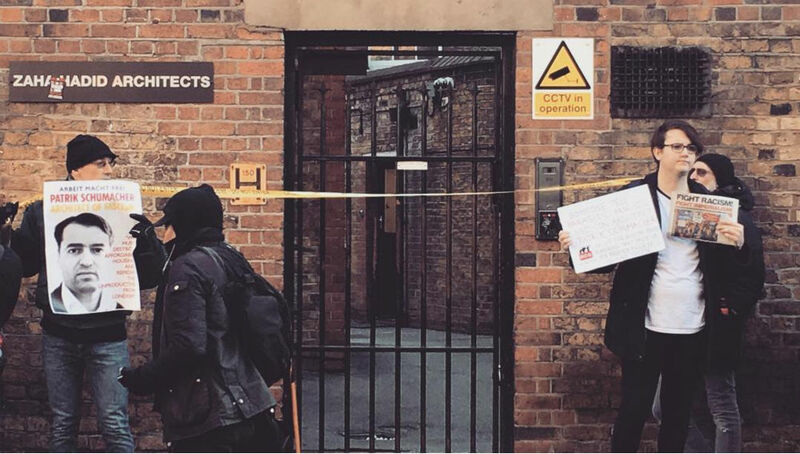 In this instance, by making the audience explicitly aware of the building's natural demise, viewers become all the more appreciative of its presence and its obviously finite existence. This too is a nod to another philosopher—Martin Heidegger—who said “mortals nurse and nurture things that grow and specifically construct things that do not grow.” Subsequently, audiences are afforded lines of thought relating to entropy: What happened before the dwelling entered this state of dereliction? What were the possible paths of destruction that lead to this? What will/can happen next? 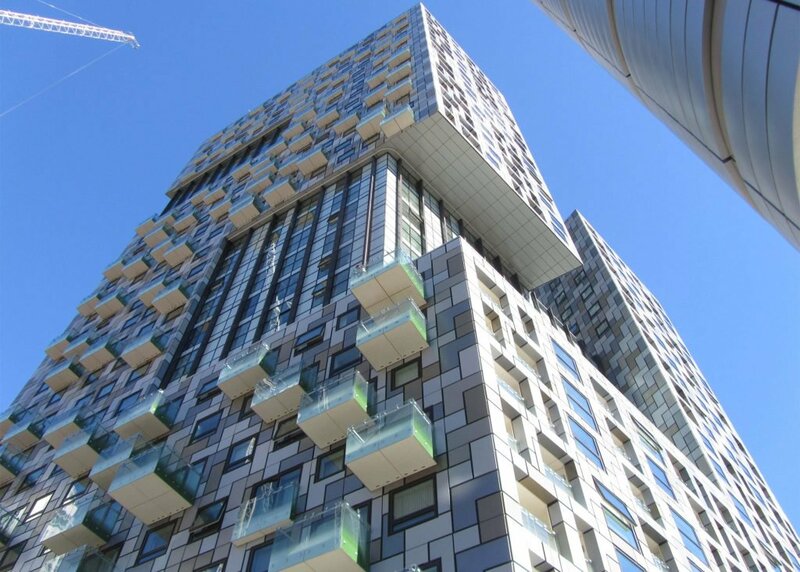 The unpredictability of nature versus the rigid lineage of the building plays out for the viewer. After You Left and A Gentle Collapsing II are available to see through December 16 this year. Although Pingu may have been well-accustomed to immaculately furnished igloos, it's fair to say that most humans are not. However, those strolling the banks of the River Thames this winter may find just that. 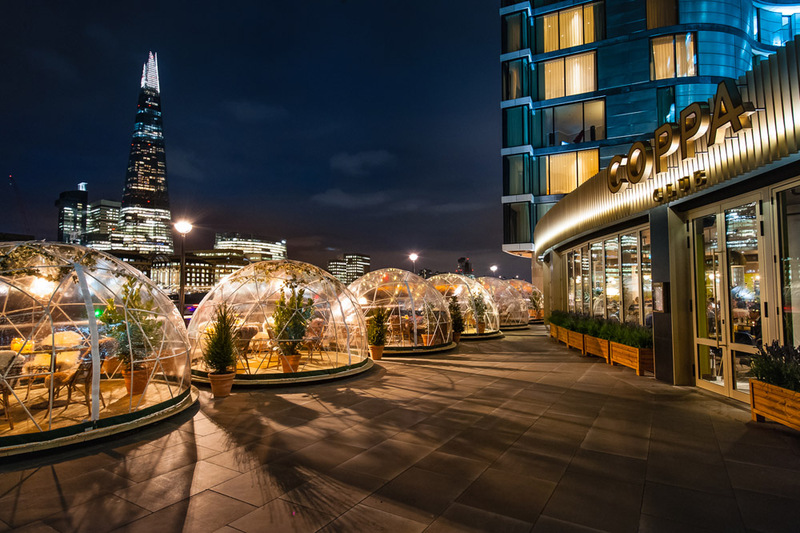 Located a stone's throw from Tower Bridge, the Coppa Club in London has installed a series of PVC pop-up igloos for people to dine, drink and socialize in. At 11.5 feet in diameter, each of the eight igloos provides views onto the HMS Belfast warship, Tower Bridge, and the Shard as well as the sky above (though London isn't quite the place for stargazing). Heaters and sheepskin blankets keep the hemispheres cozy and aim to attract visitors to the area in the less busy winter months. "The terrace is so busy in summer," said the designer of igloos, Theresa Obermoser, speaking to The Architect's Newspaper (AN). "It was important to create a space where people can sit outside and enjoy the view even when it is cold. The igloos are great because guests can still enjoy the marvelous view while sitting in a nice warm igloo." Three of the igloos are fitted for dining purposes meanwhile the remaining five serve as lounge igloos. Capable of accommodating eight people, Thonet bentwood chairs with leather seat pads and sheepskin blankets, combined with oak wood tables topped with glass pendants, complete the classy urban/arctic dining experience. For the lounge igloos, Obermoser said it was "important to mix different fabrics" to "create a cozy feeling." Here, a mix of vintage rattan and Gubi chairs, with velvet sofas, linen cushions, and more sheepskin blankets can be found. Floor reading lamps and festoon lights illuminate the spaces while funk, soul, and jazz play out from the inbuilt speakers. Obermoser also said that planting was added to all the igloos to "soften the look." "With the amazing view given it was the biggest challenge to make the igloos feel as cozy as possible but not to block the view on tower bridge or the Shard with any of the furniture," she continued. The PVC hemispheres from Garden Igloo are fixed onto the heavy bases with wooden floor. "I had to design to make sure the igloos wouldn't be blown away." The igloos at the Coppa Club won't be by the Thames for long, though. All eight will be open until January next year. 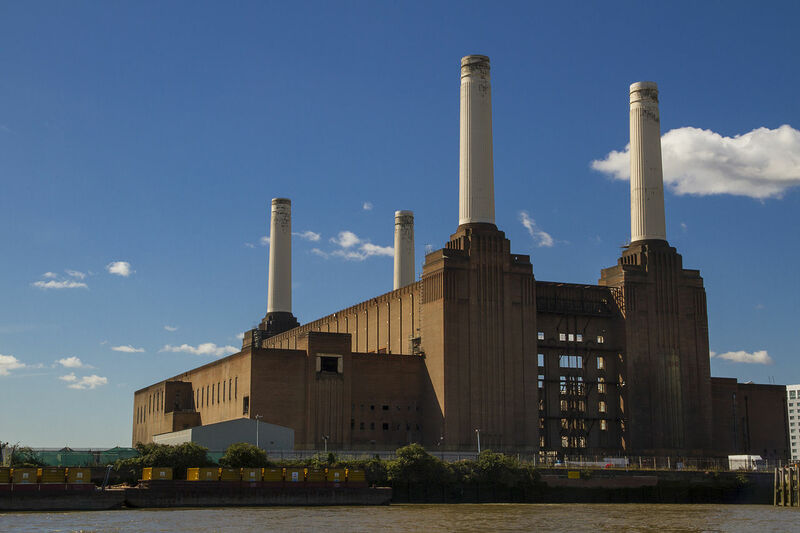 Since the founding of London, the mighty Thames has been the city’s main artery, linking north and south, east and west, encouraging business, activity and recreation. But at night, the river becomes a ribbon of darkness, a place that few enjoy and at odds with the ambition to make London a 24 hour city. This project will bring light, energy, beauty and recreation to the river and at the flick of a switch, transform the city at night. Despite waxing lyrical, Rothschild's words did not impress critic Oliver Wainwright of The Guardian. "[It’s] simply not true. 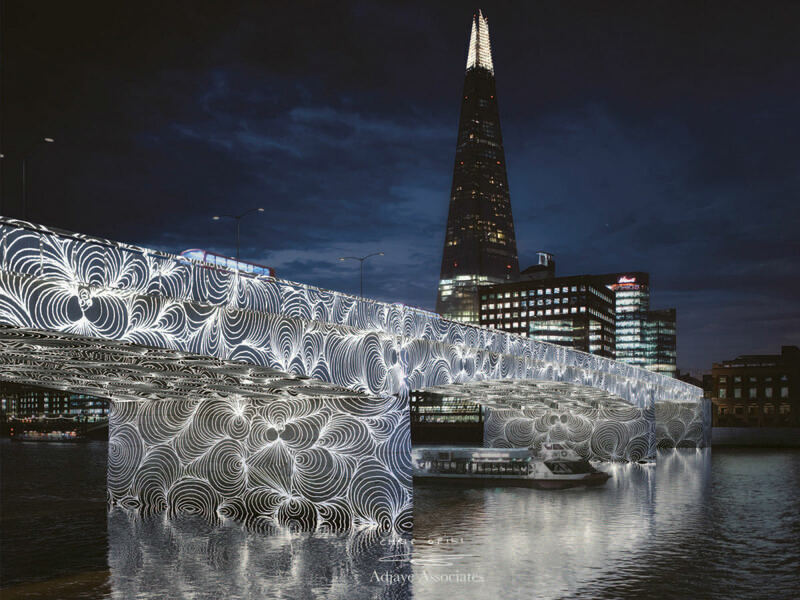 The river already shines with a series of conflicting color schemes that speaks more of London’s chaotic character than a curated nightly show," he said. 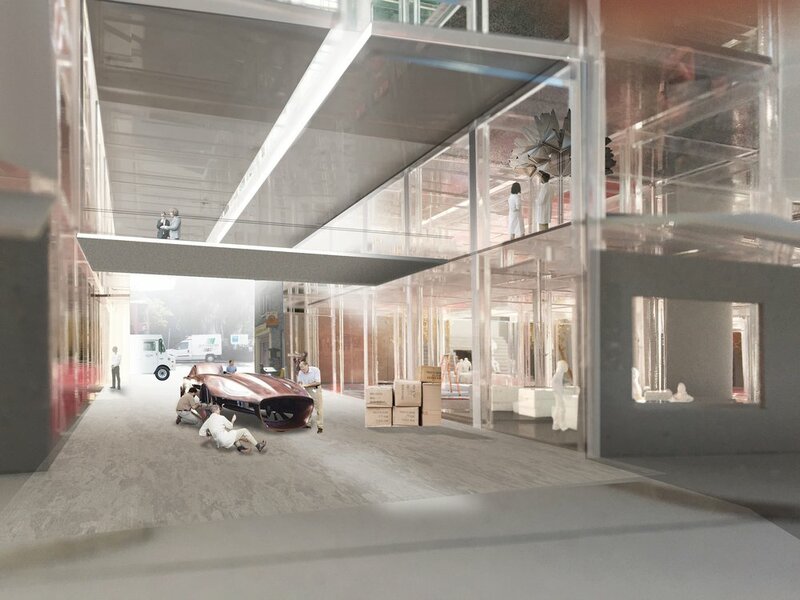 Wainwright also poured scorn on Adjaye's proposal, remarking that the 17 pavilions the architect proposes alongside each of the bridges adds "more clutter to the streetscape." The project will be privately funded. So far, though, $11.8 million is still required. 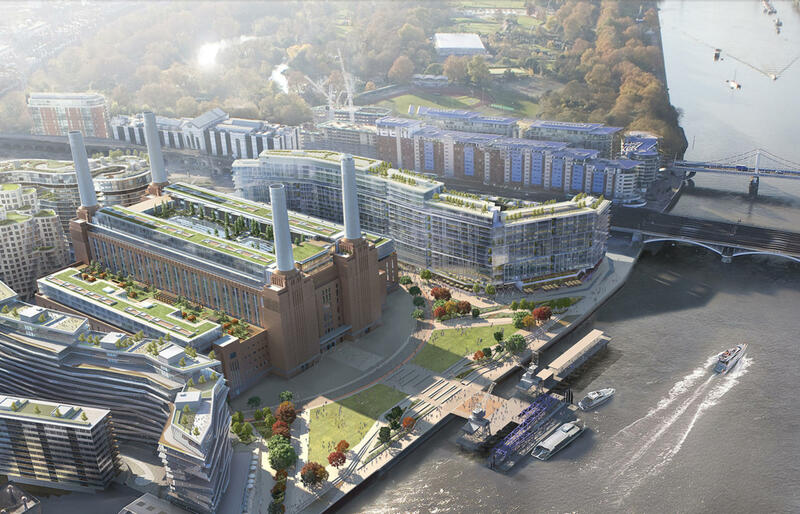 It's also worth pointing out that the infamously costly (and not yet built) Garden Bridge by Thomas Heatherwick started life in a similar vein. The shortlisted six's videos can be found below meanwhile images are in the gallery above. Blurring Boundaries Adjaye Associates with Cai Guo-Qiang, Chris Ofili, Larry Bell, Jeremy Deller, Philippe Parreno, Richard Woods, Mariko Mori, Lorna Simpson, Teresita Fernández, Joana Vasconcelos, Angela Bulloch, Thukral & Tagra, Katharina Grosse, Glenn Ligon, Doug Aitken, Tomás Saraceno, onedotzero digital consultants, Plan A Consultants, DHA, Hurley Palmer Flatt, AKT II, AECOM, Arup, Sir Robert McAlpine, Tavernor Consultancy, DP9, Four Communications, Hayes Davidson digital visualizers, Bosch, and iGuzzini. The Eternal Story of the River Thames AL_A, Asif Kapadia, Simon Stephens, SEAM Design, Arup, GROSS. MAX., Mark Filip, Soundings, and DP9. Synchronizing the City: Its Natural and Urban Rhythms Diller Scofidio + Renfro with Oliver Beer, Arup, Copper Consultancy, L’Observatoire International, Penoyre & Prasad, Jennifer Tipton, and Transsolar. Thames Nocturne Sam Jacob Studio and Simon Heijdens with Studio Dekka, Daisy Froud, Elliott Wood, Jackson Coles, and Professor John Tyrer. A River Ain’t Too Much To Light Les Éclairagistes Associés (L.E.A. ), ecqi ltd. and Federico Pietrella in association with GVA Lighting Europe Limited and ewo srl. Current Leo Villareal with Lifschutz Davidson Sandilands and Future\Pace. Atelier Ten, Beckett Rankine, Bradley Hemmings, Core Five, Futurecity, Greenwich +Docklands International Festival, MBNA Thames Clippers, Montagu Evans, Pentagram, and Price & Myers. Winners are due to be announced in early December with work on the 17 bridges being completed in phases between 2018 and 2020.